The Achilles (Calcaneal) tendon is a common tendon shared between the gastrocnemius and soleus muscles of the posterior leg. It connects the two muscle groups (collectively, triceps surae) to the calcaneus bone. 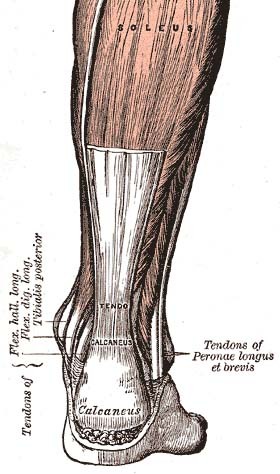 Generally, the tendon winds 90 degrees on its path towards the heel, such that the gastrocnemius attaches laterally and the soleus attaches medially. A subcutaneous calcaneal bursa permits movement of the skin over the flexed tendon. A deep bursa of the Achilles tendon reduces friction to allow free movement of the tendon over the bone. The tendon provides a distal attachment site for the gastrocnemius (lateral and medial heads) as well as the soleus muscles. It inserts onto the posterior surface of the calcaneus (heel bone). The plantaris tendon also fuses with the medial side of the Achilles tendon proximal to its attachment site. Through the action of the triceps surae, which raises the heel and lowers the forefoot, the Achilles tendon is involved in plantarflexion of the foot (approximately 93% of the plantarflexion force). The anatomy of the tendon provides for both elasticity (recoil) and shock-absorbance in the foot. It is the largest and strongest tendon in the human body and is capable of supporting tensional forces produced by movement of the lower limb. The Achilles tendon is susceptible to damage with repetitive use or overload. These types of injuries typically occur in athletes and are usually sports or exercise-related. The most common types of injuries are due to overuse and Achilles Tendon disorders, of which 55%-65% are diagnosed as Achilles Tendinopathy. Insertional issues (Retrocalcaneal Bursitis and Insertional Tendinopathy) account for 25%-35% of cases, with the remaining diagnosed as partial tears or undiagnosed complete ruptures. Complete Rupture of the Achilles Tendon has been estimated to occur at a rate of 5.5 to 9.9 per 100,000 in North America and between 6 to 18 per 100,000 in Europe. Roughly 60-75% of ruptures take place in sporting activities, including basketball and soccer. The foot is plantarflexed against resistance or gravity (body weight) while observing the posterior leg. The VISA-A is a self-administered questionnaire that evaluates symptoms and their effect on physical activity for patients with chronic Achilles tendinopathy. The Matles Test is a visual diagnostic test for suspected Achilles Tendon Rupture. The Thompson Test is used to identify the presence of a complete Achilles Tendon Rupture and is performed by squeezing the calf. A summary of treatment interventions for Achilles Tendinopathy can be found in the Achilles Tendinopathy Toolkit. If a physician advocates for a non-surgical approach, the foot is typically placed in a cast or splint, such that it is held in plantar flexion. This treatment can be combined with early physiotherapy. Use of a protective device that allows mobilization 2-4 weeks post-operatively. A review on the topic advocates for educating patients on the potential risks and benefits of each type of treatment, including operative and nonoperative types. A meta-analysis of randomized trials of Achilles tendon rupture repair has suggested that a nonoperative approach, in which plantar flexion is used to produce tendon apposition, can allow adequate healing. Functional bracing and modified postoperative mobilization, including daily active plantar flexion exercises, may stimulate tendon healing and reduce the potential rate of re-rupture. A review of the literature to evaluate the efficacy of conservative eccentric exercise for Achilles tendinopathy. ↑ 1.0 1.1 1.2 1.3 Moore KL, Agur AMR, Dalley AF. Essential clinical anatomy. 4th ed. Baltimore: Lippincott Williams & Wilkins, 2011. ↑ Drake RL, Vogl AW, Mitchell AWM. Gray's anatomy for students. 2nd ed. Philadelphia: Churchill Livingstone Elsevier, 2010. ↑ 8.0 8.1 8.2 8.3 Pedowitz D, Kirwan G. Achilles tendon ruptures. Current Reviews in Musculoskeletal Medicine 2013;6(4):285-293. http://link.springer.com/article/10.1007%2Fs12178-013-9185-8 [Accessed 15 Mar 2015]. ↑ 9.0 9.1 Soroceanu A, Sidhwa F, Aarabi S, Kaufman A, Glazebrook M. Surgical versus nonsurgical treatment of acute achilles tendon rupture. J Bone Joint Surg Am 2012;94(23):2136-2143. http://jbjs.org/content/94/23/2136 [Accessed 30 Mar 2015].